A new central bank chief improves the chances of securing an increase in a $50 billion credit line with the international lender. President Macri and the IMF are gambling that a freer floating peso will spur growth, not instability. But time is running out for the bet to pay off. Former governor of Argentina's central bank, Luis Caputo, speaks alongside Economy Minister Nicolas Dujovne during a news conference in Buenos Aires, Argentina May 4, 2018. 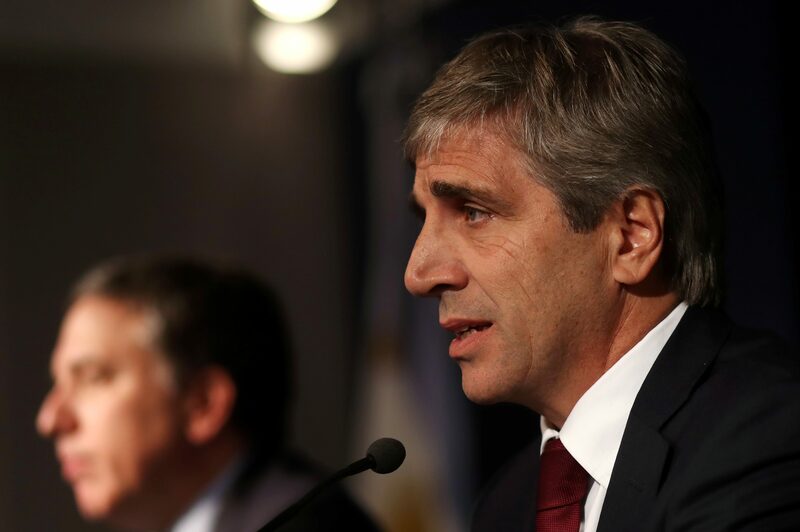 Luis Caputo resigned as governor of Argentina’s central bank on Sept. 25, three months after taking office. “This resignation is due to personal reasons, with the conviction that a new deal with the International Monetary Fund will re-establish trust in the fiscal, financial, monetary and exchange rate situation,” the central bank said in a statement. President Mauricio Macri appointed Economic Policy Secretary Guido Sandleris as the new head of the central bank. Sandleris is a close ally and deputy to Economy Minister Nicolas Dujovne. Argentine media had in recent weeks reported growing tensions between Dujovne and Caputo. A spokesman for the IMF, which is negotiating with Macri’s government over an increase in a $50 billion credit line agreed in June, said the organization’s staff and Argentine authorities “continue to work intensively with the objective of concluding the staff level talks in very short order”. The Argentine peso fell nearly 7 percent to 40 against the U.S. dollar in early trading on Sept. 25 before recovering to around 38.50 at the close of trading in Buenos Aires. That was down 3 percent from the previous day. The Merval index of Argentine stocks rose more than 2 percent to 33,955.